A2C2 (AFMA Array Color Chart) produced by FoCal for a Nikon D800E with Nikkor 24-70/2.8G lens at 24mm f/2.8 at 1.2m distance. Previously in my blog, I reported about an issue with the D800 AF sensor array to provide accurate enough results when using its left bank of sensors (cf. /2012/05/d800-outer-sensors.html). The issue seems to be rather general, affecting many Nikon cameras with that AF module produced until now, i.e., D800, D800E and D4. E.g., until Nikon ceases to remain silent on the topic, Thom Hogan decided to flag the D800 "Not Currently Recommended" (www.bythom.com/nikond800review.htm). I think the D800 is a great camera with that particular flaw Nikon will eliminate sooner or later, with or without ever making a comment about the issue (Nikon promised to keep me up to date about news coming from Japan but so far, none have been received which they wanted to share). So, customers of the D800 are well adviced to get their cameras fixed (by service) or exchanged until the issue is resolved. That's a better advice than to buy a different camera because there isn't any true competitor. The Nikon D600, Canon 5DmkIII or Sony A99 are nice but lack the medium-format alike resolution. This is why I think it is important (even for Nikon) to have an as simple and as reliable as possible procedure to check for the AF array issue. There are many ways to use this software. But there is one "best practice" method of how to use this software to produce meaningful results. Unfortunately, it isn't the default setup. Open the "Multi Point Focus Test tool". 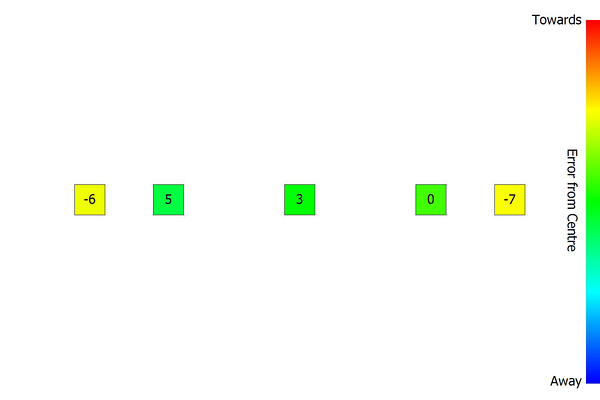 Tick AFMA: From: -20 To: 20, using Count: 6 steps rather than 5. Tick Validate Focus Consistency to 2 percent rather than 6 %. Run the test and save the chart from page 3 of the PDF (or screenshot after the test is complete). This chart is a color coded chart with best AFMA AF micro adjustment values printed in the colored boxes. Due to a bug, the values are truncated but the colors are still correct. I call this color coded chart the A2C2 (AFMA Array Color Chart). Deviations (from the center AF point) much larger than 10 appear red or blue, around 10 appear yellow or cyan, smaller values are greenish. An important point is that the A2C2 shall be interpreted for an f/2.8 lens (i.e., a lens with nominal aperture of f/2.8 -- an f/1.4 lens measured at f/2.8 does still not produce a comparable A2C2). The above paper contains examples for other cameras (Canon 7D, Nikon D3), other lenses incl. f/1.4 and measurements which translate the AFMA unit step into physical dimension (µm) of focus shift. I found out that the AFMA scale for Nikon is more fine-grain than for Canon. Moreover, I consider deviations of up to 10 to be tolerable (may be corresponding to deviations of up to 4 for Canon) in the A2C2. AFMA values can vary up to +/-3 for Nikon (which would probably only correspond to +/-1 for Canon) from run to run and around the optimum value, have no perceivable effect on sharpness. The A2C2 with an f/2.8 lens should be green, yellow and cyan (Nikon) or all greenish (Canon). With a lens faster than f/2.8, the chart is allowed to look "worse": With a Nikon and f/1.4, some red or blue (deviations up to 20) is acceptable. With a slower lens, the chart should become increasingly green. Focal length, distance or sensor resolution have no or only little impact on the interpretation of the A2C2. A2C2 for a Nikon D800E with Nikkor 24-70/2.8G lens at 24mm f/2.8 at 1.2m distance. Second run for select AF fields. A2C2 for a Nikon D3 with Nikkor 24-70/2.8G lens at 24mm f/2.8 at 1.2m distance. Run for select AF fields. As you can see, a Nikon D3's A2C2 (below) looks ok according to the above interpretation guideline while the D800E (above) does not. The title image is the same D800E as this image above, only for a full run testing all AF fields. It does also equal "Sample 2" of the previous blog article cited above. It is obvious from the full measurement that the full left AF bank is affected by the issue and that the leftmost outer AF field isn't actually the worst one (at least not always). Other D800 or this D800E with other lenses have/has problems with the right bank too. If you go to Photokina 2012 in Cologne, maybe visit the Nikon booth and deliver your copy of the A2C2 chart to document that not only "a few" cameras have the problem and that you possibly expect an official word from Nikon. I would appreciate too if visitors could leave a link to their copy of the A2C2 chart in the comments section of this article, with name of the lens used. Maybe before/after servicing comparisons too. Falk, Would you be interested in seeing results for the D4? If so, please advise if any of the test parameters should be different for the D4. Thanks, noirist. Hi Norisit, yes, a D4 would be interesting to compare with. Parameters are the same. Most easily compared are 24-70/2.8G at 24mm f/2.8 and 1.20m distance. Simply because there seem to be many results to compare with already. How many of the targets should I stitch together for that test? You can FoCal's Target Setup Feature to check for the area which should be covered by target printouts. I used 12 sheets to cover the entire AF area and to be on the safe side. However, if you select only 5 AF fields (what I would recommend to do) in the center row, you can probably do with 3 sheets placed behind the left, center and right regions of interest. Not even necessary that the target printouts are placed seamlessly. But of course, if you play with focal lengths and distances, a seamless tiling is convenient. Falk, Here are the Reikan Focal 1.6 results for my D4 with Nikon 24-70mm lens at the prescribed distances. Overall I found the multipoint autofocus test to be inconsistent as shown by the included results. Best, noirist. noirist, thanks a lot. The results at 70mm and the first one at 24mm are not plausible. Maybe too close, wrong aperture, no idea. The center offsets are pretty big too. The second and third result at 24mm look more plausible. And while there are some random outliers, it overall looks like what I expect from an f/2.8 lens: deviations of up to 10. I did the 24mm at 1.2m and the 70m at 3.5m. All were at f2.8. If I run the same FoCal test twice in a row under (what appear to be) the exact same test conditions, I get different results. Should I try again? Norist. Hi again. I must say that I have no idea why you have problems to obtain reproducible results. As you can see in my paper, if I repeat the test, numbers are pretty close from run to run. I would first try to figure out why the center adjustments vary so much (if you change focal length). Maybe, the printed target or illumination lack sufficient quality or you have some blur due to shake. In my full article (white paper, in the caption of Fig.1), there is one PDF for a full report (click right to download). You may want to compare in order to find the differences. The individual "quality" data points should form a nice somewhat bell-shaped curve when plotted vs. AFMA. If not, you have an issue with your test setup. I followed your steps to test my D800 and the result showed Red color for the left most point even though the different in AF Fine Tune is definitely not more than 10. For eg, center point -4 (green), third left -1 (yellow), left most -2 (red), third right -3 (green), and right most -1 (orange). According to your website, the color will only be red if more than 10 in difference. How do I interpret this? thanks for doing the test, maybe you can share the image. 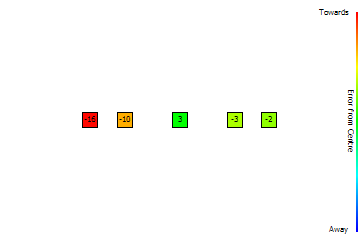 As for the red color for "left most -2 (red)", I think I explained the issue in the full white paper. You may have missed this little detail. The point is that FoCal 1.6.0 has a bug in its PDF export where it truncates AFMA values to two digits (sign included). So, your result was anything between -20 and -29 but got truncated to -2 when formatting the chart. The (red) color though is still correct. Which is why I said the A2C2 chart is composed of colors only (figures to be ignored). You have one more digit displayed within the FoCal GUI and I used screenshots for my blog article to somewhat circumvent the problem. I believe I must have missed that. Thanks for pointing that out. In that case, can I say that my D800 is having the left af issue? In fact I have done some test chart images shot and although the images taken with left most af point are a bit softer than center point, it is definitely not similar to those images posted with very blurry shot. I wonder how do I convey the message to Nikon Service Center to have it fixed? Is there anything else you would recommend me to do? thanks for sharing your result. Assuming you used an f/2.8 lens (which one?) for the test, then AFAICS it is a typical result for a D800 which Nikon would like to service for better outer AF sensor performance. You are right, there are worse units out there, but your's is a typical case which came out of fab with an unsatisfactory calibration quality. Nikon isn't proud of such units as previous cameras and fresh batches of D800 (supposedly) perform better. You may have to find the proper Nikon repair center which was enabled to handle this issue. I cannot answer this for the US. Nikon should need nothing than the notice that you have one of those early D800 needing a proper AF calibration. If you like, send your A2C2 chart and an URL to my article. I'd like to see results for new D800 coming from Japan, and of D800 returned from empowered Nikon service centers. Any? Sorry that I forgot to mention the lens used is 50mm f/1.8G wide open when tested. Does it make any difference compare to the f/2.8 lens? Anyway, my D800 s/n starts with 8008xxx which was purchased in June. I believe Nikon Malaysia is one of the service centers that is able to solve this issue based on what Ming Thein posted in his blog. Ok, I will try to contact Nikon and see what they say. Thanks a lot for your helpful response and I appreciate it. Yes, that does make a difference as I tried to explain in the article. It is highly likely that the AFMA unit step width scales with the lens maximum aperture F-stop number. At Photokina, Nikon confirmed to me that the AFMA unit steps depend on the lens' aperture. So, what is measured as 20 with an f/2.8 lens could be measured as 31 (20*2.8/1.8) with an f/1.8 lens. If red in your case is as little as 20, then it could have been as little as 13 with an f/2.8. Still above 10 and something one may be concerned about. But it is a border case then. Of course, your red could have been 29 as well ... The best would be to repeat the test with an f/2.8 lens. Hi Falk, thanks for sharing your findings here. So if I understand this correct, I cannot test my 50/F1.4, I can only test my F2.8 lenses, or does it mean that if I want to test my 50/F1.4 - then I must set aperture to F2.8. The camera internally scales the AF fine tuning vales to a more fine grain step. I.e., the AFMA unit step scales proportionally with the Fstop number. This means that with a F/1.4 lens, deviations up to 20 in the AFMA values would probably still be acceptable and to be expected from any Nikon (corresponding to about 7 with a Canon camera which is also to be expected). Therefore, an A2C2 chart with red fields alone is not a problem with an F/1.4 lens. You must read the actual values while still in the program and check manually that they don't become larger than 20 (as a difference to the center value, I mean). It may just be simpler to use an F/2.8 lens then. It doesn't help to do the test at F/2.8. The Nikon firmware reads out the lens data and the calibration is done for the lens, not a single aperture. Changing aperture may influence the accuracy which FoCal is capable of. But it won't influence overall results. First, you may want to calibrate a lens with spherical aberration for a given particular aperture. Because the result may then vary with aperture. Second, setting the aperture manually allows to provide FoCal with better images, sharper at focus AND becoming softer off-focus quick enough. First of all a Massive thanks for this articel (and the rest). have a coiple of questions if you don'tmind. Is the varation e.g the far left returned -2 and -4 both light green in the chart and the inner right one from 5 (green) to -2 (light green) - Is this type of varartion normal. First, because you did your test with an f/2.8 lens and the variations are 10 AFMA steps or less (8 actually) your D800 looks ok. Maybe, a few lenses may perform worse but your D800 should be a good copy overall. So, if anybody ever wondered: Yes, good copies of the D800 (wrt outer AF accuracy) do exist. The variations are pretty normal. In my own report, I ran one test twice and you can compare the results too. Because Nikon uses such a small unit step (about 4 µm with an F2.8 lens) which is a much smaller unit than Canon's, AF fine tuning with one unit precision isn't possible for an F2.8 or faster lens. 10µm variations are the norm. I.e., variation around 3 are to be expected and ok. You have one variation of 7 and you may want to look at the corresponding curves. Maybe, they are pretty flat. Anyway, nothing to worry about. Thanks Falk, had a quick look at the curves and they are not flat. Both for that focal point are roughly the same shape i.e. both show a large peak for the best focalpoint,just happens to be in a different place. Started to fine tune my lenses - my 85mm F1.8 and 105mm F2.8 macre both need +16, my 24mm-85mm 3.5f-4.5f VR needs +4 at the 85 end. Also have a 135mm DC which I have always struggled to get consitent good results with which needs more than +20. Is there apont at which if your lenses mostly need a lot of correction that you think thats it worth sending the body back in? I have done this test, but not sure how to interpret it fully. The AFMA values vary from 11 to -17. Most of them are between -6 to +7. The lens use was a 50mm 1.8G. The 24MM 1.4 the left side varied from -11 center to -23. Can i share the PDF for your inputs? I have done this test on two D800E cameras. The first one from the first lot and had a serial No. 8000###. What i noticed was that the center row is perfect but some of the other sensor are totally off. In this nearly all the sensors appear to be ok except the extreme left sensor. Is this Ok considering that i am testing with a 50mm F1.8 lens. The above comment was ok, but it contained an unrelated advertisement link. Don't do that on my blog! I run a zero tolerance policy wrt spamming. I have run the test on my D800 using 24-70mm @ 35mm / f/2.8. Seems like a clear example of one with an issue. I've bought mine in Dec. 2012, so a bit surprised. Will bring it to a Nikon service point for correction. Frédéric, thanks for your test. As this is for the 24-70/2.8G where I can compare results, I must say that this is an exceptionally bad case. Also, there is now enough evidence collected that the statement which Nikon made at Photokina 2012 was a bit bold. It is true that they have a calibration routine at their disposal which is able to ameliorate the phenomen a bit. It basically makes the left and right banks behave more equally. However, it is my personal belief now that their calibration routine is not able to bring a "bad sample" really on par with a "good sample" out of factory. There seem to be parameters beyond the control of Nikon service points. I therefore would insist that Nikon replaces rather than calibrates your particular unit. OTOH, I would keep a unit with a pattern more like the one in the title of this blog article, i.e., with only a few red AF points rather than an entire bank. I'd even hesitate to bring it to calibration then. The right AF points matter more to me than the left ones (use them in portrait mode for focus onto the eyes etc.). I can live with a few AF points which have bad calibration if the rest of the AF system is accurate. Frédéric, the screenshot you post above is from 3 shots only (for the left bank). The derived best AFMA predictions are not trustworthy with this few points. Such results must not be published. I withdraw my evaluation of your results. Nothing can be said of them.